We’d love your help. Let us know what’s wrong with this preview of Silly Feeling by Willowy Whisper. But Hannah can't rid the feeling, and as the week unfolds, she wonders if perhaps it's not such a silly feeling after all. To ask other readers questions about Silly Feeling, please sign up. Well! For a book titled "Silly Felling," this was a bit heavier than I had thought it would be. I really enjoyed it, though! I found it hard to keep track of some of the characters, because there were so many, at some points, but by the end, I was able to figure it out. My favorite part was the adorable relationship between Madison and Mark. :) I also like Morgan and Nick (Icecream! ), although the whole fake suicide that Morgan thought happened surprised me. I was surprised though, that the part Well! For a book titled "Silly Felling," this was a bit heavier than I had thought it would be. I really enjoyed it, though! I found it hard to keep track of some of the characters, because there were so many, at some points, but by the end, I was able to figure it out. My favorite part was the adorable relationship between Madison and Mark. :) I also like Morgan and Nick (Icecream! ), although the whole fake suicide that Morgan thought happened surprised me. I was surprised though, that the part with Taylor and Marti wasn't completely resolved. Woah... With the title of 'Silly Feeling', this detail-rich story was anything but silly. When I read words like 'church camp' and 'crush', I was expecting a light-hearted story about a couple teenagers. This story was deep and heartfelt, moving and fast-paced. Although it's great as a short-story, I think this could've also been a fabulous novel. :) All the characters were fun and felt realistic. Nick and Morgan were my favorites – Nick's story *almost* made me cry. :') Hannah Woah... With the title of 'Silly Feeling', this detail-rich story was anything but silly. When I read words like 'church camp' and 'crush', I was expecting a light-hearted story about a couple teenagers. Hannah’s character was easy to lo Silly Feeling by Willowy Whisper was a fantastic, quick read! It was extremely well written, full of amazing characters, rich descriptions, and lots of suspense. From the beginning of the story, there was an element of unease, though it would be impossible to predict the story’s outcome from that feeling. Everything was done realistically, and tied together beautifully. The way this book was done was just so amazing. I loved every word of it and every character. Way to go, Willowy Whisper! :) 5.0 stars!! Silly Feeling is a short, easy to read story. It has romance, suspense, and lots of characters. Willowy did a great job developing most of the characters, especially Hannah and Girth. There were a few parts that were confusing, but nothing that took me totally out of the story. 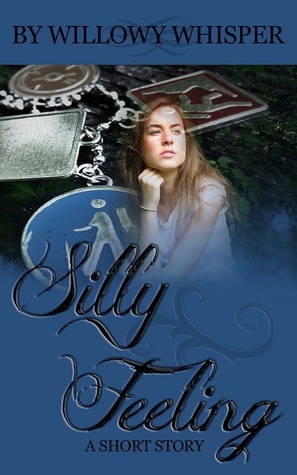 Silly Feeling is a cute short story with just a touch of romance and suspense. There was a whole slew of characters, and I found each of them interesting and unique. Even the minor supporting characters captured my interest. The plot had some fun twists and side stories that kept me interested all throughout. Overall, I really enjoyed this fun little story. There were a few typos and grammatical errors, but nothing really major. A job well done, especially by such a young author. She has some real talent! What age would I recommend it for? Any ages, really. It was quite clean! This was a really interesting short story set around church camp. It involved many different characters (sometimes a downside as the varied POVs got confusing trying to remember who was who), all of whom have different struggles. It was a fun peek into the lives and emotions of teens away at church camp. I can't say too much due to spoilers, but some of the kids had some issues and it was interesting to see it all play out. The writing was excellent and the main reason this story got 4 stars. Ms. This was a really interesting short story set around church camp. It involved many different characters (sometimes a downside as the varied POVs got confusing trying to remember who was who), all of whom have different struggles. The writing was excellent and the main reason this story got 4 stars. Ms. Whisper has some amazing talent and I look forward to reading more of her work. If you're looking for a quick read I'd pick this up. The content tended toward the more serious side with some of the characters, but overall it was a good story! This review has been hidden because it contains spoilers. To view it, click here. This book was completely different from what I had expected. The plot is easy to follow and I really liked the detailed and well-written descriptions of the fire and the mysterious boy who kept setting things alight. It was also unusual to read a book that is told from so many point of views, but it was never hard to follow and the plot-line never became complicated. However, I really felt that there was way too much romance in it; some was OK, like the (rather unusual) relationship between Morg This book was completely different from what I had expected. The plot is easy to follow and I really liked the detailed and well-written descriptions of the fire and the mysterious boy who kept setting things alight. However, I really felt that there was way too much romance in it; some was OK, like the (rather unusual) relationship between Morgan and Nick, but as for the rest. . .after all, it was supposed to be a church camp, yet all the girls (and boys too) seemed to be able to think about (even in the middle of a church service, which I found rather shocking) was whether or not so-and-so was looking at them/ liked them/ wanted to be their girlfriend/boyfriend, etc. and besides, most of the characters were very young, thirteen and fourteen years old, in some cases! I really liked Hannah, she seemed the only really sensible one in the entire camp, and the teachers were very likable as well. I would have really liked to have found out who it was who rescued Hannah from the fire. All-in-all a clever plot, very suspenseful, and excellent descriptions, especially of the fire. WILLOWY WHISPER is a young, Christian fiction author. She lives in a beautiful place called West Virginia, nestled between mountain and field. She is the author of ten novels, nine of which are published, and numerous short stories. She enjoys playing the piano, the guitar, and the ukulele; painting; photography; and graphic design. She is also a born-again believer in Jesus Christ, an incurable r WILLOWY WHISPER is a young, Christian fiction author. She lives in a beautiful place called West Virginia, nestled between mountain and field. She is the author of ten novels, nine of which are published, and numerous short stories. She enjoys playing the piano, the guitar, and the ukulele; painting; photography; and graphic design. She is also a born-again believer in Jesus Christ, an incurable romantic, and a passionate dreamer. To follow her, visit her blog at www.willowywhisper.com.